A year ago I wrote, “Roadside Photographers Just Get Lucky”. I said those photographers that cruise the highways and byways by vehicle looking for subjects, “must be prepared and ready at a moment’s notice to grab the camera from its bag on the back seat, roll down the window (that’s a must), take a quick exposure reading, and shoot.” I saw them as distinctive among scenic, bird, and wildlife photographers and discussed how I thought luck played an important part in their photography. These photographers don’t always have the luxury of time to attach a tripod to the camera base, and need to quickly and accurately meter, shoot fast, and be ready for other cars that slowly pass as people try to see why the car is stopped. Loosing composure by madly waving or yelling, “Go, go, go. Get out of my way!” doesn’t work very well. That car will pass and hopefully won’t ruin the shot. The light isn’t always optimal, and the perspective and angle of the shot is going to depend on the road and the placement of the vehicle in relationship to the subject to be photographed. There are those roadside shooters that only use little point and shoot cameras, but the serious roadside photographer is equipped with a DSLR, the skill to use it effectively, and experience to understand how to work with restricting conditions. Roadside photographers don’t go out to photograph a particular subject. Much of the time, skilled multi-taskers that they are, roadside photographers will be involved in other activities like going to work, visiting friends, or making that run to the store before supper, yet still are on the lookout for any kind of subject to photograph, and are silent about how the picture they are showing was made by chance, and from behind the steering wheel of their car. It sounds so much better for viewers to think the picture was made after detailed planning or some lengthy excursion on foot. Over the years I have described what kind of photographer I am in many different ways. I won’t bore readers with that, but these days I see myself as an opportunist when it comes to the images I capture on my camera’s sensor. Most of the pictures I am able to make on the roadside are because of my sharp-eyed wife, Linda. 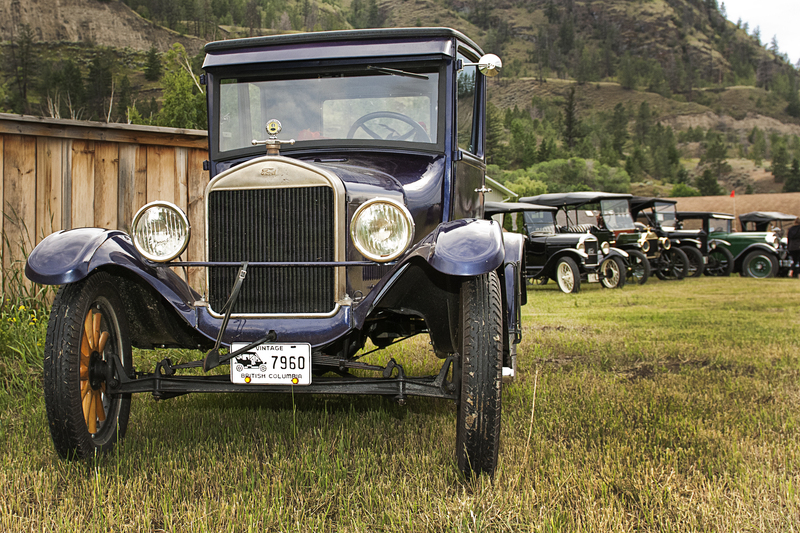 I thought about this roadside, opportunistic photography as I pulled off the Trans Canada highway to stop and photograph a field filled with pre-1920 cars that Linda saw and I almost drove by. The Antique chapter from the larger organization, Vintage Car Club of Canada www.vccc.com had picked a location just outside of Kamloops, British Columbia, to hold their meet and had been touring around the area for the past two days. 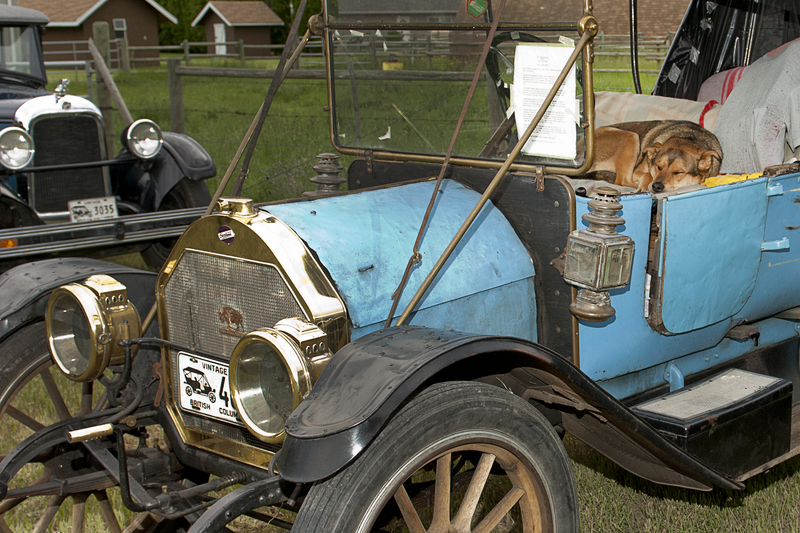 We sometimes see groups of restored old cars on the highways which I suppose is not that surprising with a 23 chapter, 1200 member-strong, Canadian car club. However, spectators usually surround them and chances of getting clear shots or even talking to the owners are rare. 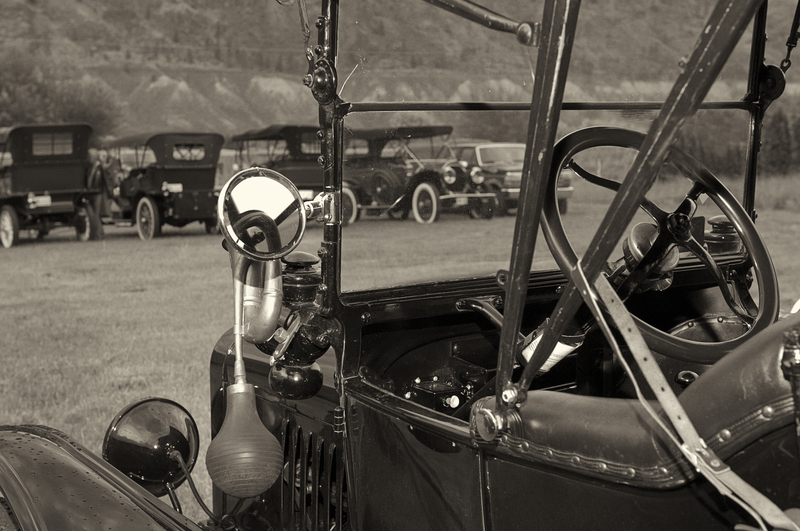 But in this instance the wonderful antique cars were parked in a circle in a wide-mowed field and, unlike other car shows, spectators were absent and I could take all the time I wanted composing pictures, and even talking to owners about the club and receiving personal stories about their cars. I was lucky. I already said roadside photographers just get lucky. The cars, the lack of other people, other photographers, and because I had been working earlier in the day at another job meant that I had my 24-70mm lens and a good flash and I got to get out of my car ready for the pictures. I was lucky. The sky had clouded over reducing metal glare and the warm evening light was perfect, all I had to do was add some fill light with my flash to bring out the character of the vintage cars. I began by just photographing those that interested me the most, then after the initial excitement I slowed down and walked around again trying to compose my pictures to tell a story instead of just documenting cars in a field. I like cars, and like many men view them as works of art. As a photographer the chance to wander around photographing vintage cars is just plain fun, however, truth be told, I will stop to photograph pretty much anything. When the subject of film comes up my first impulse is to flippantly say something like, “Oh, film was nice, but no serious photographer would use film.” Well, that’s not right. And should any of us be putting a definition on what a “serious photographer” is? In my opinion, film, and those photographers that use it have positioned themselves in a new place among image-makers. These days most photojournalists and commercial photographers employ digital technology, but I think those that are interested in pushing this medium into a creative place are increasingly becoming aware of the unique characteristics of film. A film purist can easily set up a home lab with an enlarger and complete chemical process, but there are also those that have embraced both digital and film and the results of the technological cross breeding can be exciting. Film has, in my opinion, a tactile quality that is different than digital capture. Let’s not get into the boring discussion of film vs digital. That’s become wearisome. Film is different than digital. I think it depends on how one wants to show a subject to viewers. And as I wrote, I think the technological cross breeding of film and digital is exciting and rewarding. The dialogue now may be about computers, monitors, and software. With film we wanted the best enlargers, and enlarger light sources. What lens was mounted on the enlarger was as important as the lens on our cameras. I had a cabinet filled with many different kinds of enlarging papers from around the world, and another stacked with a wide assortment of developing chemicals for both film processing and printing. All this is still available if one is willing to take the time searching out suppliers. Serious digital photographers are faced with expensive computers and Photoshop’s steep learning curve. Those serious practitioners of film photography will still be dealing with lots of learning. However, quality film cameras, and quality film processing equipment is cheap and the required processing and printing equipment can easily be found languishing at garage sales. I think one needs to search out the best film equipment in the same way as the best digital hardware. I don’t use, or even think about, film much, but in the last two weeks I have had several conversations with different young photographers that are making images with film cameras and starting to accumulate the equipment to process film and print pictures. I will admit I enjoy talking about all that. I liked film cameras and same as with today’s photographers, I thought about and researched those cameras in my quest for what would fit my needs the best. On the subject of using film photography and digital photography, this week has also found me reproducing a client’s very old photographs. (some easily over 100 years old) I photographed each image, loaded them into my computer, then using PhotoShop corrected the fading and discoloration, added contrast, retouched cracks, and finally sharpened and saved them on a CD. Most photographs were over 40 years old will start to fade soon, if they haven’t already. And those boxes of family history may be lost as people move them to damp basements or garages when additional space is needed. Making a quality digital image from the negatives or slides of those wonderful old family photographs and saving it on a space saving CD is ideal. As I mentioned these two mediums work just fine together and a matching print can be made it the future. I welcome the chance to exchange thoughts with those photographers who are using film in this day of digital technology. Many see it as a “retro” kind of thing, but maybe it’s not that at all. Including film in the creative and artistic process of photography is just one more factor in the continuing evolution of this exciting medium. This photographer’s thoughts on photography as art. I didn’t include an image this time because I couldn’t think of what would fit with my philosophical musing. Wikipedia, the free, on-line encyclopedia states that, “Fine art photography refers to photographs that are created to fulfill the creative vision of the artist. Fine art photography stands in contrast to photojournalism and commercial photography. Photojournalistic photography can be defined as photography that provides visual support for stories, mainly in the print media. Commercial photography’s main focus is to sell a product or service”. Photography as art has changed over the years since the beginnings of photography in the mid 1800s, and in my opinion, with the dramatic escalation in photography and the making of photographs since digital technology became the mainstay, photography as art interests more and more people. By the middle of the nineteenth century photographers felt their art should be held in the same exalted status that painters claimed for theirs. Their contention was that it was the photographer, not the camera that made the picture. The goal was, and still may be, to convince not only the art community, but also the community-at-large that photography should be treated as art. Then, as now, the discussion was about whether the different aspects of photography, commercial, photojournalistic, or those created only as personal creative vision should be considered art. Presently, that art may be nothing more than a screensaver on one’s computer display. Some photographers do go further and it is not unusual to see a personal photograph, or that of a friend’s, framed and hanging on the walls of one’s home. I have always been interested in art photography and over the years studied the history of when photography started being included as art in major exhibitions as well as what is currently being accepted as art in the medium of photography. The Wikipedia definition is interesting because it separates what it declares as fine art photography from photojournalism and commercial photography. The question photographers can ask is, whether their photographs only work as “visual support”, are produced to “sell a product” or as a creative vision? Do many photographers wander around documenting the world around them and hope to be lucky enough to have final images that fit into one of those categories? I often wonder about that. However, I personally have come to think that definitions as to categories have changed. Maybe it is the way modern viewers see and use photography. That quickly-snapped portrait of a favorite pet displayed in the owner’s home is cherished enough to be included as art along with the rest of the owner’s sometimes expensive art collection even though some scholars of the arts may disagree. Remember, even in this technology charged time when making photographs is more popular than I think any other pastime, photographers are still contending with critics that hold that only painting and sculpture are real art. For me the lines have become blurred, and I see photography as an artistic medium equal to others, although I am not altogether comfortable in categorizing any photographer’s work. The camera is a tool that helps photographers be creative and photographers only need to decide on their own particular style, and what, as Wikipedia states, is “created to fulfill the creative vision of the artist”. In my opinion, what that “creative vision” is should be entirely up to the photographer and the audience for whom the image is produced. 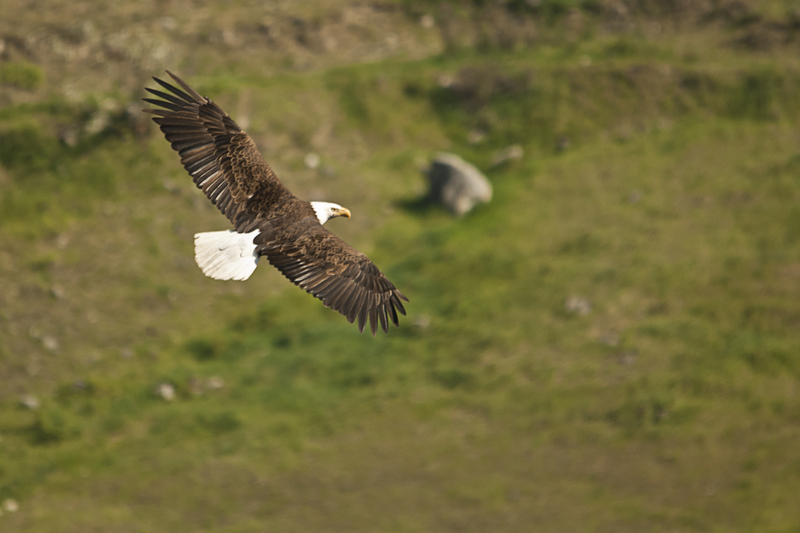 Two weekends in a row have seen me climbing up steep, loose, shale-covered cliffs to photograph eagles where they live high above a long, green, lake-filled, British Columbia valley. However, this last week the weather has been cool, pretty wet, and certainly not good conditions for climbing or wildlife photography. Oh, well, I had intended to stay away from those eagles until the chick was ready to fly later in the summer anyway, and I expect the interior of this province was getting a bit dry so the rain is welcome. 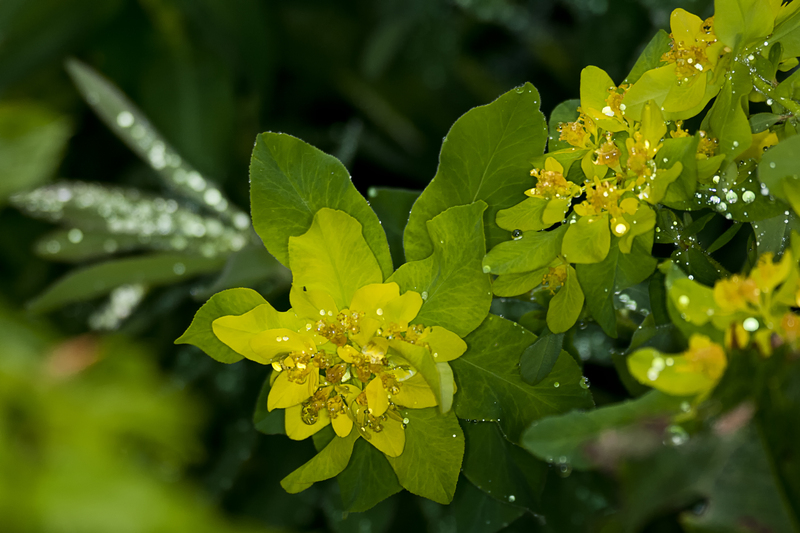 As I drank my morning coffee to a forecast of another day of rain I forgot about those birds and instead decided to go out into my wife’s garden to do some photography of her very wet plants. Hmm… I seem to make a lot of decisions over that first cup of coffee. 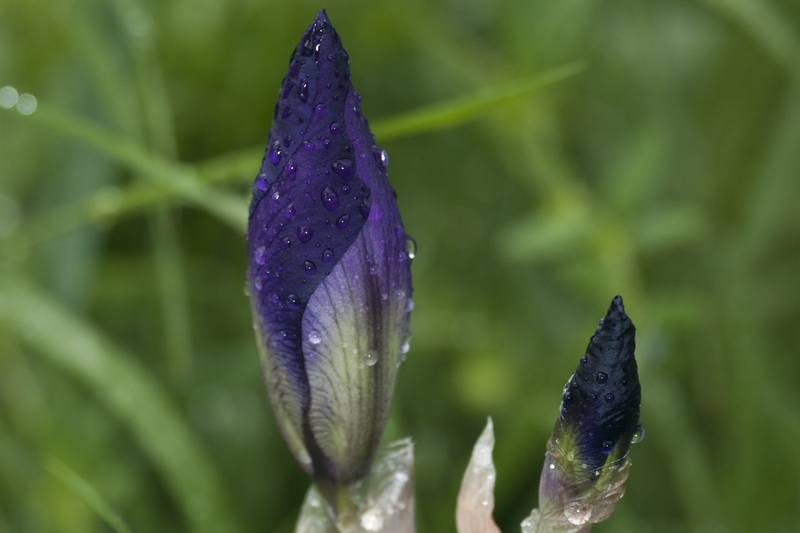 Just after a good rain is a favorite time to do garden photography and the dripping, spring morning was perfect. When I mentioned I was going out, my wife, Linda, grabbed her camera and rubber boots and joined me. Linda placed a ring flash on front of her 70-180mm macro lens and I used a 200mm macro and included a stand-mounted, off-camera flash. 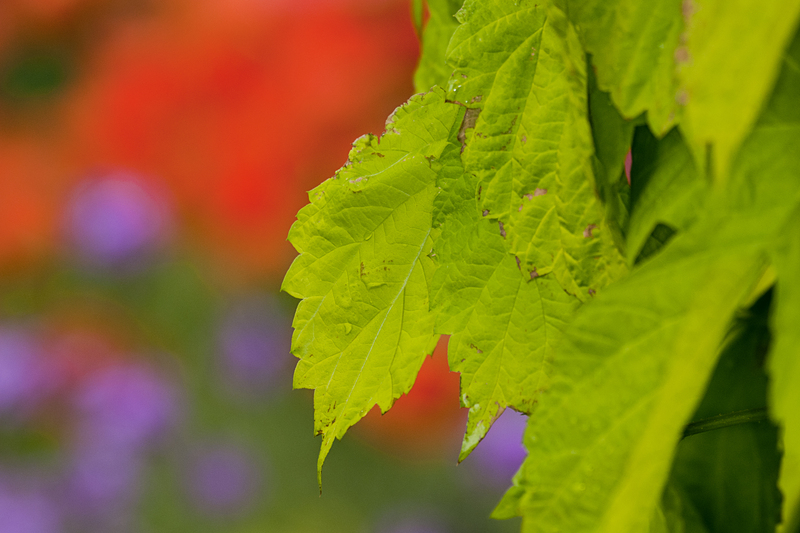 Adding light on the overcast day gave our images contrast and “pop” in the otherwise flat and limited lighting conditions of the rainy day. We both used monopods to steady our cameras as we moved around in the wet landscape. 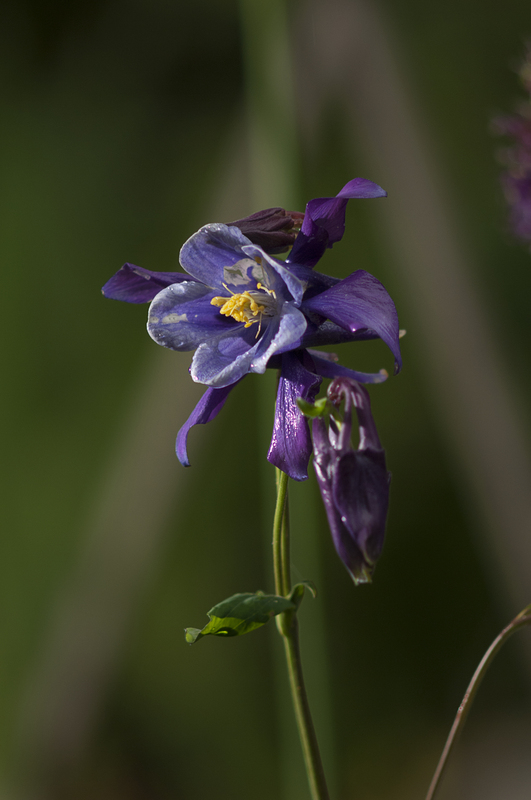 When photographing plants I meter much the same as I would if I were doing an out of doors portraiture of a person. Selecting the camera’s manual exposure mode, I meter for the proper ambient, or existing, light exposure of my subject, and stop down to reduce the overall exposure. Then I add light. If the flash is set to TTL, then I use its exposure compensation feature to increase or decrease the power. 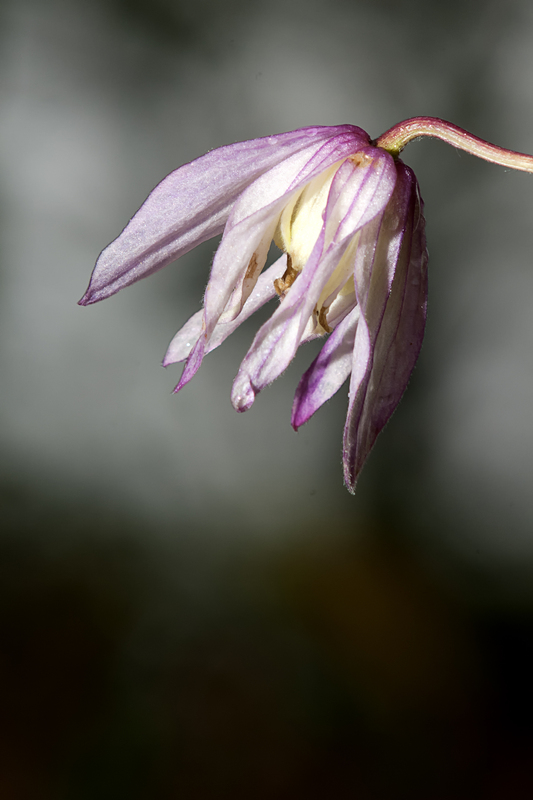 If the flash is set to manual I move the flash closer or further away from the subject (in this case, the flower) until I get the illumination I want. We enjoyed our photography in spite of the steady drizzle and I’ll mention that it is a good idea to keep wiping the slowly accumulating water off one’s flash. I don’t worry about my camera because it’s weather sealed, but the electrically charged flash is another matter. I know many photographers would opt for the dry comfort of home on a day like this, but sometimes we need to make our own photographic opportunities and even though this isn’t as exciting as hanging off a high ledge photographing eagles, I personally can’t think of any kind of photography I find more enjoyably relaxing than ambling through a garden capturing interesting light on interesting shapes, and the addition of rain drops on leaves and flower petals makes everything all the more creative. We don’t have to go far to find something interesting to photograph. For my wife and me that location is just outside our front door and on that rainy day we would walk back to the cover of the porch to view and discuss the images on our camera’s LCD, and then we would step back into the garden and continue. There were no camera bags to be packed, trip planning, or driving of a car to a distant destination. 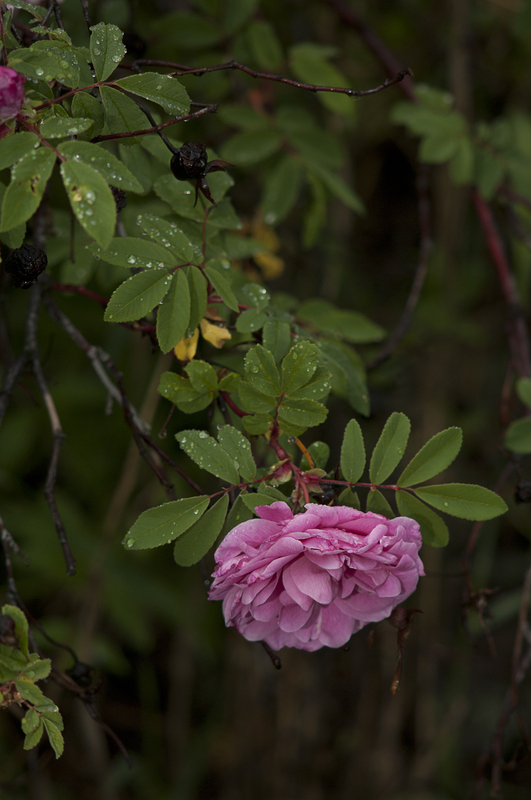 I am sure that is why I got interested in garden photography in the first place. It isn’t so much that I am fascinated with flowers, however, as a photographer, I am interested in colours, shapes, shadows and how easy it is to access all that. When I first started venturing into my wife’s garden, I would do it as a way to relax after a day of work. Now it’s just fun photography that I recommend to any photographer wanting to be active with their camera. Be sure to click the “follow” button. Or, at least, select the “like” button. I will thank Humbled Pie, http://humbledpie.wordpress.com for the Leibster blog award nomination. I had to look it up and will apologise that its origins are still unclear to me. However. I am delighted that someone appreciates my words about, what to me is, the exciting world of photography. I enjoy reading and looking at pictures – so in my mind perusing the vastness of the Internet for Bloggers that are also consumed with photography is educational, inspiring and fun. 1.Add a photo for the award you received to a blog post. 2. Link back to your nominating blogger in your post. 3. Tell us some random stuff about yourself that might not be evident by following your blog. 4. Nominate some worthy bloggers for the same award you received and leave them a note linking them back to your award post. I am “sort of” retired. When it comes to choosing subjects to photograph I am opportunistic. Although readers already have found it apparent, I really do enjoy almost everything about photography. And can be drawn into any conversation that touches on the subject of photography. 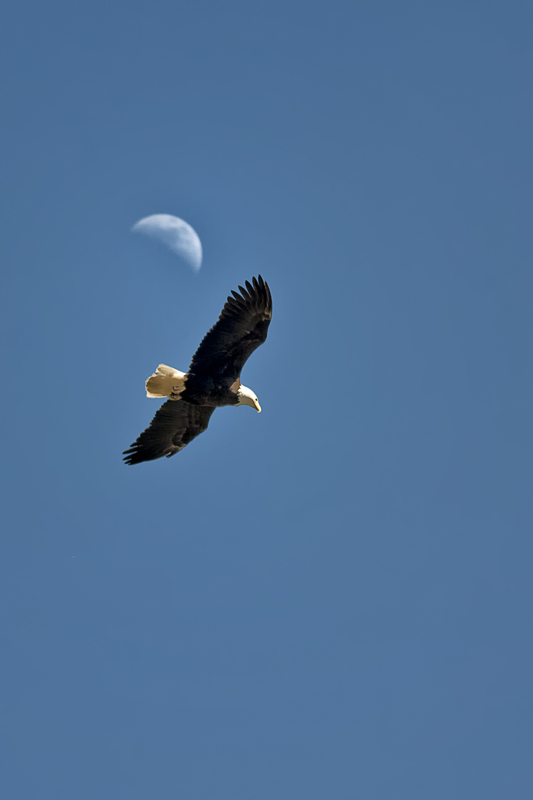 Generally, when looking for eagles viewers are peering upwards, and most photographs of eagles are of eagles flying high or perched overhead. So, thinking of all that, it was with excitement that my friend, Walter, and I began a somewhat hazardous climb up a steep, loose, shale-covered hill that would allow us to photograph an eagle’s nest from above. 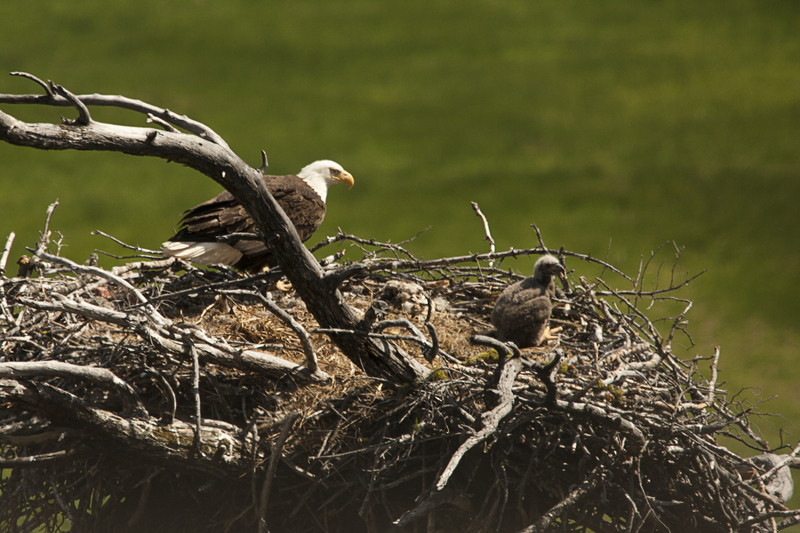 He had found and climbed to this nest late in the spring about four years ago, but that time he only made a couple of photographic climbs because he thought he might be bothering the eagles. I was able to photograph it only once and what a great day that was. Last week Walter and I made the half-hour climb again and we found a position on a ledge where we could watch and photograph the eagles from a distance slightly further away than where we were four years ago. This year there was one fluffy chick in the nest and although I am sure they were very aware of our presence, with the added distance between them and us, they didn’t seem to be bothered. Walter brought his Sigma120-400mm and I had my wife’s 150-500mm. Both are big and heavy lenses, but because we followed the old photographers adage, “always select a shutter speed number that matches the focal length” neither of us had a problem handholding our hefty lenses. I know fixed-focal length lenses tend to focus faster and are usually sharper, but for this excursion we both wanted the versatility of multi-focal length (zoom) lenses. The only difficulty we had was the climb. The shale was loose and we caused small avalanches as we crossed and slipped over the face of the hill. I stepped wide and constantly leaned into the hill and had to watch where I placed my feet seeking stable footing. And looking about, or straightening up, only increased the probability that one would end up bruised some distance down the steep hill with damaged equipment. When we finally reached our photography perches we sat quietly for a while as our trip up was noisy and we expected we might have agitated the eagles. After a time we moved to where we each could see the family of eagles, then pressing our eyes against our viewfinders we both began photographing them. The day was clear and bright, so a sky shot, although dramatic, was always a silhouette. 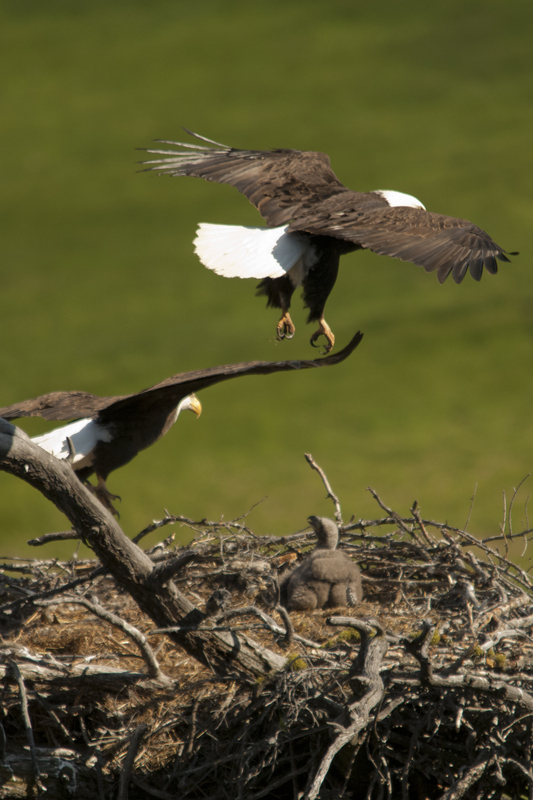 I wanted to show the eagles on the nest, to include parents and the chick, so most of my shots were level or angled downwards. The eagles would sit at the nest for long periods, and then seemingly take turns flying off to perform acrobatics high in the windy sky. Too high to photograph, but amazing to watch all the same and when they did zoom back to the nest I would start releasing the shutter all the time wondering if any of my captures would be usable. Bird Forum, www.birdforum.net, claims to be the largest birding community, dedicated to wild birds and birding. The advice on photographing birds, by one of the moderators is, “A bird will pretty much let you know if they feel threatened by you so you should let them be your guide… The birds come first. Sometimes your close proximity to a nest can cause the parents to abandon the nest,… close proximity to a nest will only invite other predators to the nest… The best way to photograph birds is to make yourself stationary rather than chase them down. Stay put, you would be amazed at just how close the birds will come to you once they are comfortable”. It was a great day for both of us; outdoors, fresh air, sun, wildlife, and great pictures to help us remember. The eagle chick should be full grown by nine weeks, and now that we know we aren’t bothering them we’ll plan another visit shortly. Be sure to press the “Follow” button.